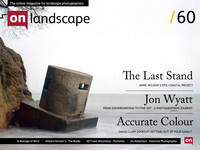 Non-award winning landscape, travel, architectural photographer and writer based in South Devon. David Clapp follows on from our short article last issue about icc profiles with a look at gamut and how you can ensure that your pictures don't clip colours. An icc profile or colour space has a 'gamut' which is the range of colours that it can represent. For instance, sRGB was designed by HP in 1996 to work with their printers and monitors and because technology wasn't particularly great at the time, the colour space didn't need to address a large range of colours.